Pope Francis waves as he arrives at the palace of Caserta, former residences of the Royal House of Bourbon, before leading a mass, in Caserta, southern Italy July 26, 2014. 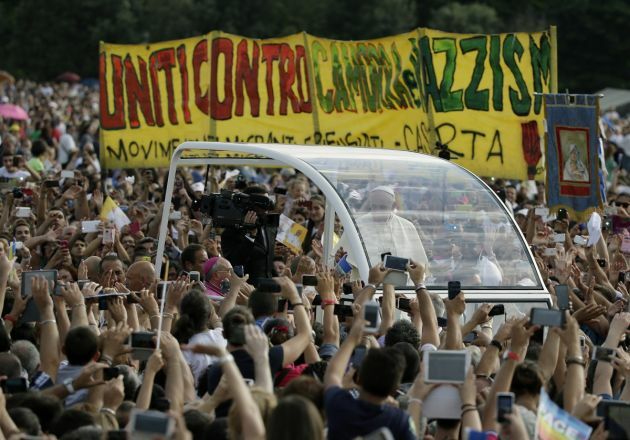 A banner behind the Pope reads "Against Camorra and Racism." Pope Francis has apologized in front of a group of Evangelic Christians for persecution inflicted on Pentecostals under Italy's fascist regime during the mid-20th century and in which Catholics were involved. Around 200 and 300 evangelicals from the United States, Argentine, and Italy attended the July 28 meeting in Caserta, in the southern part of Italy on Saturday. There were some 200,000 people gathered in a place said to be a stronghold of the Naples Mafia known as Camorra. Matteo Calisi, former president of the Catholic Charismatic movement, and Jorge Himitian, an Argentinian Protestant attended. "With men like you, there is hope for us, as Christians," saidItalian Evangelical Pentecostal pastor, Giovanni Traettino, a friend of Pope Francis, the Vatican News Service reported. The Pope also rallied for Christian unity calling for a "church that is one in its diversity." Francis spoke about the relationship of Catholics with Pentecostals in Italy saying "Many times we have done the same thing as the brothers of Joseph, when jealous and envy have divided us. "And these laws were ratified by baptized persons! Some of those who enacted these laws, and some of those who persecuted, denounced their Pentecostal brothers because they were 'enthusiastic', almost 'crazy', who spoiled the race. "I am a Catholic pastor, and I beg forgiveness for this. I ask your forgiveness on behalf of those Catholic brothers and sisters who did not understand and who were tempted by the devil; and who did the same thing that Joseph's brothers did. "I ask the Lord for the grace to recognize and to forgive," said Francis. The Pope had a three-hour meeting with televangelists Kenneth Copeland and James Robison on June, just weeks after he met with U.S. Pastor Joel Osteen and other religious leaders.